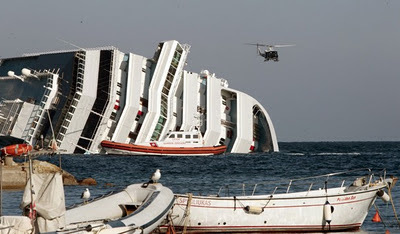 Check out the luxury cruise ship, Costa Concordia, as leans after it ran aground off the coast of Isola del Giglio island, Italy, gashing open a 160 feet on the hull and forcing some 4,200 people aboard to evacuate aboard lifeboats to the nearby Isola del Giglio island, early Saturday, Jan. 14, 2012. About 1,000 Italian passengers were onboard, as well as more than 500 Germans, about 160 French and about 1,000 crew members. Passengers described a scene reminiscent of "Titanic", complaining the crew failed to give instructions on how to evacuate and once the emergency became clear, delayed lowering the lifeboats until the ship was listing too heavily for many of them to be released. To date it's being reported that 3 total deaths have occurred.